These white papers present in-depth discussion and analysis into specific aspects of embedded systems applications and how Total Phase tools can help engineers improve the development process and reduce development time. USB Type-C is the newest, most powerful USB port to date, but full adoption will take time. Increased use of Type-C Legacy Adapters will require complete testing to verify safety and performance. 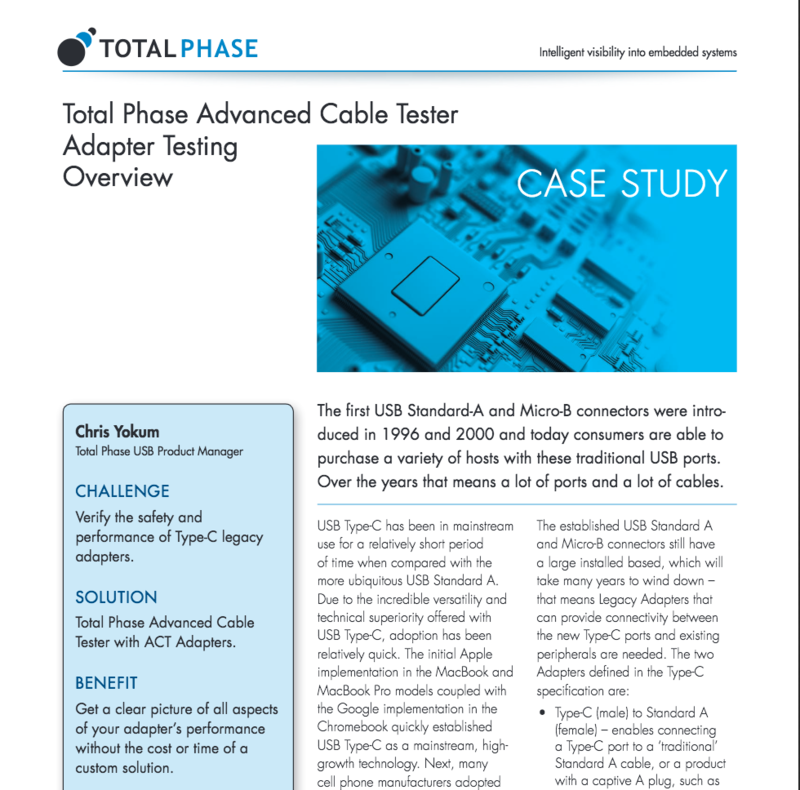 Total Phase offers the Advanced Cable Tester, which allows users to test and verify the Adapter’s performance without the cost or time of a custom solution. The purpose of this white paper is to review best practices for testing the suitability and quality of these Adapters. The times are changing. The evolution of both SPI and I2C protocols has increased demands for better tools to debug newer features including the need for remote- and network-equipped Test & Measurement equipment, for both engineering and production environments. Learn about what tools you are going to need in your toolbox to keep up with the trends. This training, presented by Alan Ott of Signal 11 Software at the 2014 Embedded Linux Conference is a great introduction for developers new to USB. Learn the basics of USB structure, syntax and the application of USB to your project. The presentation also includes sample code for USB host/device setup, and instructions to use a Protocol Analyzer to measure performance and debug. Developers have long sought a solution that offers the real-time insight into USB bus activities required for effective debugging, coupled with custom class decoding to enable visibility into early development or proprietary protocol classes. In this case study, MCCI Corporation demonstrates how they used the Total Phase USB Beagle 480 Protocol Analyzer and Data Center application coupled with their own custom application to decode their protocol of interest (RNDIS) to meet their advanced debugging needs. PHYs are a crucial part of all SuperSpeed USB analyzers as they perform the critical role of decoding and deserializing the analog signals. These solutions typically fall into two categories: USB 3.0 compliant PIPE-based solutions, or non-compliant, generic deserializers. Enhancing productivity is within reach with true real-time Protocol Analyzers. Coupling a blazing USB 3.0 downlink with the ability to begin debug sessions as soon as the "Start Capture" button is pressed enables a level of speed, scope, and precision not previously possible with any Protocol Analyzer. Real-time, interactive analysis allows developers to spend less time waiting for data, and more time on actual application development. Signal probing techniques have become more complex as a result of the wide adoption of high-speed serial bus technologies, including USB, PCI Express, SAS, and SATA. With the technical challenges present from rapid increases in bus speeds, developers need to use active repeaters to probe high-speed signals. This article provides an overview of protocol analyzers and explores the probing design techniques used in today's high-speed protocol analysis solutions. This article will explore methods to quickly identify common problems that engineers may experience when developing a USB application. By using a USB protocol analyzer to provide visibility into the USB traffic, engineers can reduce development time and simplify the troubleshooting and debugging process. At Cornell University, in the Autonomous Underwater Vehicle program, the Beagle I2C/SPI Protocol Analyzer was used extensively to help the students design and debug a passive acoustic array. The Space and Systems Development Laboratory (SSDL) at Stanford University created the KatySat program to encourage K-12 students to pursue careers in science and technology. SSDL partnered with Total Phase to provide tools necessary for the project. The complexity of the USB protocol increases the difficulty in identifying problems. USB protocol analyzers provide visibility into the raw USB traffic, allowing developers to quickly and efficiently identify problems.